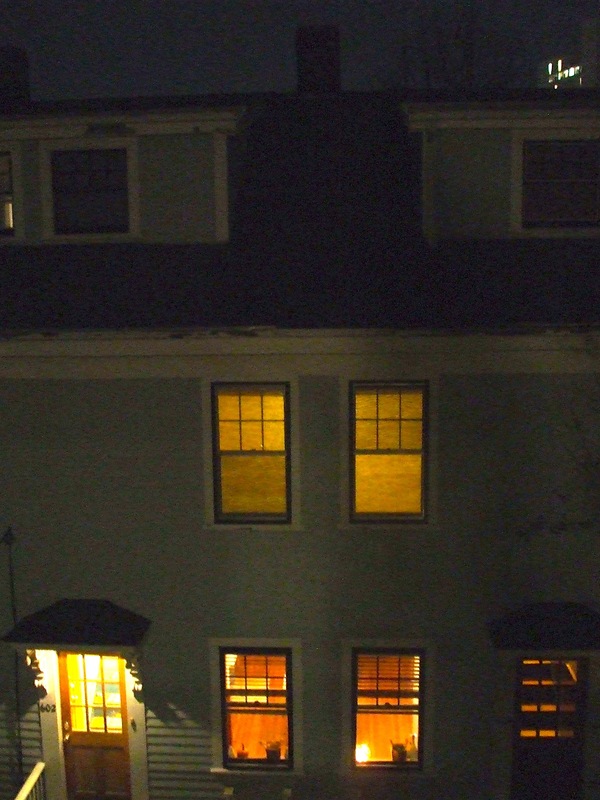 as the final hours of the month of november melt into the newborn ones of the month of december, i find myself jumpy. jumpy and oh-my-goodness-y every time a chirp or a burp or a hiss or a moan rises up from the belly of the flat little phone that follows me everywhere. on call if not for flat-out midwifery, well then for the auntie approximation thereof. in which, once the labor pains come, come hard and deep and unrelenting in that way that they do when they mean business, she will stuff the toothbrush into the bag, the one that’s already packed clear down to the street map. she’ll rumble down the stairs, shove open the door into the brisk cambridge air and hightail it straight to the fine state of maine, a mere 127 minutes away (minus the seconds i’ll certainly shave with my foot emphatically pressed to the gas). yes, any hour now, up portland way, a baby — the baby — is due to make his global debut. the stars are aligning, the planets are too. did you happen to catch that full-bellied moon? it’s as if the nightsky were a blanket, blinking on for the nursery. and, for once in my life, i am close enough to the centrifugal force that i can’t be kept from what amounts to a celestial sky dive. plan is, i’ll be there. not when the wide-eyed one first flutters opens his eyes, drinks in his mama, his papa and the whole world around. but shortly thereafter. miracle is, i’m likely to be the one to hold his big sister by the hand, feel her heart pumping straight through her palms, as she slips her wee fingers through mine. i will be there as we pad down the hallway, she and i, as we round the bend, and for the first time in her life, as she steps into the all-over glow of being the one who now leads the way. i consider this an advent miracle of the first order, the highest rung on the ladder of enchantment and wonder: to be in the room, shortly after the arrival of one strapping bundle of love upon love. and, indeed, and thank you lord, it is yet another miracle in this year of living most sumptuously. that i just happen to be a short jaunt away, just a hop and a skip down the eastern seaboard, when life stirs again in a portland delivery chamber (this one complete with birthing pool). last time, back when ellabellabeautiful was born, i was in a bedroom far far away when the phone rang, when word came, that she had arrived. with my whole heart and soul i wanted to shrink down to a dot, squeeze through one of the speaker holes and shimmy my way through the wires to pop out on the other end, where the newborn mewed. but i hadn’t yet mastered that bit of prestidigitation. so all i could do was stand there, in the dark, weeping and yearning. this time, hallelujah, i can ooze my loving, my cooing and cuddling all over the place. on the big sister. on the mama, and papa, and, yes, quietly, contentedly, all over sweet baby boy. all week it’s seemed that the baby could come, would come, at any hour. after all, all was ready, at last. the farmhouse my brother had gutted down to the studs and rebuilt of his own labors, it was complete. the little family had moved down the lane, and into the homestead, with garden and beehives and room, come springtime, for hens and their cluckings. he’d driven down to the cape (cape cod, that is) and hauled home a truckload of family heirlooms. tucked them in corners, placed them front and center in the best of the rooms. and then, as if that babe had his ear pressed to the wall, as if he knew, all’s ready, the little one began his stirrings. any day now, his mama told me. so i packed the bag, unreeled the street map. started living hour by hour, ready to rocket-launch at the drop of a pin (or amniotic waters). my boys here on franklin street will be fine, oh so fine, without me. seems apt that, come sunday, advent begins, not the countdown to christmas for me, so much as it’s the season of waiting. the season of settling deep into the quiet corners of the soul, even if it means swimming upstream from all of the madness this world has layered onto the month, and the weeks leading to christmas. how do you plan to quietly wait for that that might take your breath away? i should have mastered this. should have figured this out. should have, should have, should have. not when it comes to saying goodbye, not when the goodbye is to my firstborn, grand thump in my heart, big brother to the little guy, the one who’s been away, off at college for nearly three whole semesters now. you’d think i could get through it without the preamble rumble down in my belly, without the pounding in my heart, without the tears welling and spilling. each time, i swear, it feels like someone is unplugging a cord that keeps my glow up and glowing. that has something to do with how i breathe. that puts the purr in my heart. each time, in the hours before, as i start to feel the yanking, the turning and twisting of parts deep inside, as i start to picture the hours and days ahead without him, without the unspooling of conversation that comes, unexpected, as i chop in the kitchen, as i fold laundry, as i tie my shoes and head out for a stroll, i start to see the color draining away. i start to feel empty all over again. i think back to the days of villages, when a mother and son would never be farther than a few cottages away, down behind a waist-high stone wall, through an arched timbered doorway, in a room where embers on the hearth burned orange, persimmon and red. i wonder why, nowadays, mothers and children need live miles and miles, whole ZIP codes, away. we left the boy back in new york city. he’s a man now. my last glimpse of him was under a streetlight at the corner of 94th and lexington avenue. he filled out his shetland sweater, his chest now strikingly, breathtakingly, the shape and size and velocity of my own papa’s. a chest i always loved. a chest that made me feel safe against the world. and now that chest belongs to my son, my sweet boy, my strapping 6-foot-3 chunk of a man. as i stepped back from his hug, from his long arms, broad shoulders, soft hands, i felt the pull like stretching of dough. i, into the distance. he, into the thick of his life. a whole weekend before him, a weekend with his beloved cousin and aunt, a weekend romping through the best of new york, a new york i’ll never see. fact is, it’s his life he lives now. whole chapters and verse distant to me. unknown. uncharted. as it should be. as it’s meant to be. but that does not make the parting of mother and child one drop easier. not for this mother anyway. it’s not that i want him tucked by my side. God, no. this is why and how i’ve raised him — to spread his arms wide as wide can be, to wrap in as much and as deep as he can, and then to soar high. it’s just that along with that soaring comes the fact that mama bird’s back in the nest, or up on some other limb, watching the sky, watching the loop-de-loops. wings on alert, ready to spread, to enfold, in case there’s a fall, a need to harbor, to shelter again. and that airspace between mother and child, that life space, it just seems to take — every time — getting used to. i always think, i’ve never my fill of him. never enough of his stories. never enough of his heart. never ever enough. and then, not long after i’d swallowed my goodbyes, i watched my own tall fellow, the one i married, say goodbye to his mama, down in fair haven, on the jersey shore. and i wondered if she too always feels it. that it’s never enough. that one more breakfast together. one more walk to the river. one more, one more, would finally fill the hole. but truth is, i think it’s a hole that will never be filled. it’s a wanting that goes un-sated. it’s a yearning, a hunger, a please-come-back that lies at the heart of deep love. most especially, at the heart and soul of mother love. who in your life do you never ever get enough of? 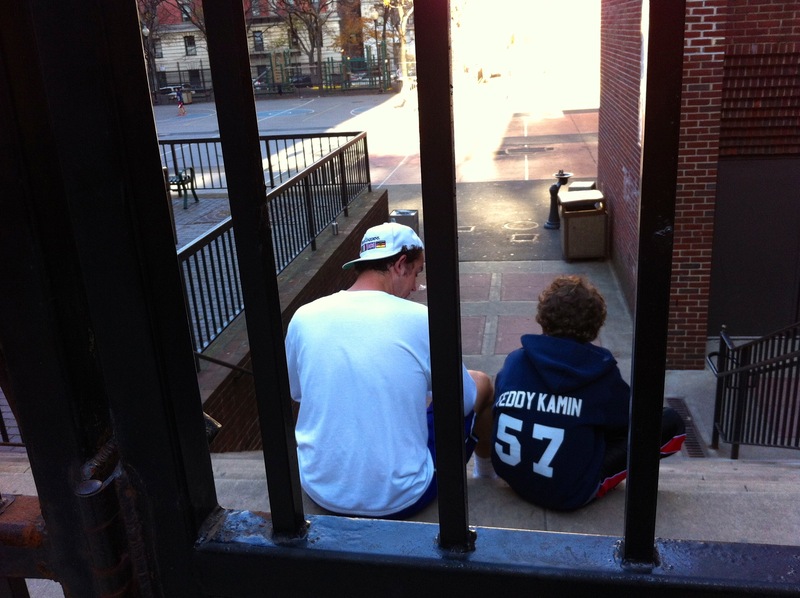 photo way above is my boys, big and little, plotting their flag-football moves in a game against the cousins, played on the lot behind the tall fence at hunter college on new york’s upper east side. i can’t get enough of watching the two of them entwine the whole of their lives…. photo below is my firstborn at his ebullient best. happy blessed season of thanks, and beginning of advent, the season of waiting…..and now i am off to a long day of writing….classes wrap up in the next couple weeks. where did that first semester go??? already i’m whispering my thank you’s. and for the record: next time anyone puckers up and calls me a little cabbage, i just might up and pinch ’em in the behind. or the apple dumpling, as a dear kindergarten-teacher friend of mine insists one’s bum be called. egad, here we are a mere three paragraphs in, and already we’re over-tumbling the market basket, spilling fruit-and-vegetable metaphors with no restraint. and while we’re at it, we’re demonstrating how very swiftly we disassemble our thoughts here, watch them scatter like thistle seed to the winds. the point is, this year’s long list of merci beaucoups promises to pack quite a wallop. thus, i’ve been gathering steam, and preambling already. might be simply that this week is supremely better than the blurry one that came just before it, the one when at any minute i was aiming to hoist a battle-worn white flag, dial t-i-c-k-e-t-2-h-o-m-e and hightail it out of this intellectual — and virus-riddled — hotbed. but even better than that, i’ve been eyeing this weekend with flat-out delight, for a river of great good folk are due to arrive in round after round of cars, buses, aeroplanes and trains. first up is the boy who’s riding a mere two hours home from his down-the-road college, for at least a few days holed up here with his doting mama and papa and wee little brother. (then he’ll skedaddle down to NYC, and live it up with his aunt, uncle and cousins, till the back-to-school hour beckons). he’ll buzz the buzzer some time round mid-afternoon on the morrow, and from then on in, it’s non-stop company. dear friends of the newspaper ilk from back in chicago are flying in for a whirl of a weekend, and some poking around of my new favorite haunts. my best friend from when i was little is coming in from california, for cryin’ out loud, by way of connecticut. an adorable fellow whose mother i love way back home is spending the night, sprawled on our couch. saturday morn, we’re due to rendez-vous under a tent with yet another family we’ve loved since the dawn of time, or so it seems. and i’m sure i’m forgetting someone or something. no wonder the deep-down thank you’s are rumbling and rolling. and no wonder this week (thanks also to an all-day friday seminar on “negotiations,” no less, one which commences at 8 bells sharp, and stretches till 3 in the afternoon), i am forced to forgo my early-morning habit of writing here at the table. 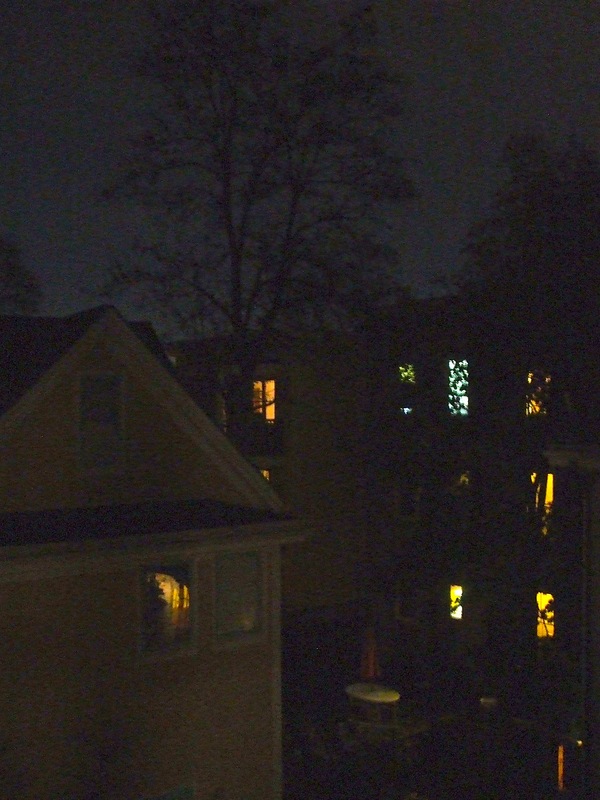 instead, tis now, with dark of night cloaked round my shoulders. all alone at the kitchen butcher block. just me and my tap-tap-tap. the only sound is the hiss of the heat pipes (hallelujah), and from the room just behind me, the occasional but regular turning of a page. which reminds me: one of my most lasting gratitudes goes out to ms. j.k. rowling who, with her pen and her brooms and her wands, has lit one whoppin’ bonfire under the reading twigs of my sweet little sixth-grader, who has been known in recent weeks to flick on the reading lamp (when he thinks we’re not looking) at 2 in the gosh-darn morning. that child, once a reluctant reader, has in the last four weeks sucked down — at last count — no fewer than 2,425 pages, like some sorta super-sweet kool-aid. and yes, even after all these weeks, there are still moments in days when i all but pinch myself, wondering how in the world we got here, in this magical place for this gosh-darn-miraculous interlude. as i walk along the parade of sycamore trees, those mottled soldiers, that line the bend in the river. as i find in the mailbox a hand-penned letter, page after page, from one of my new contemplative friends, the monks, at saint john the evangelist monastery, a place with the gift of hushing the soul. or, late most tuesday nights, as i say goodnight to the babysitter who’s become a treasured constant in the whir of our weeks, and whose capacity for kindness gives me faith all over again. as i sit in a circle with some firebrand or thinker i’ve never known before, and find my head swarming with ideas i could chew on forever — and probably will. as i curl up for hours on end with an afghan under my toes, and virginia woolf in my lap. or dorothy day. or mohandas gandhi. as i soak up first-person accounts, over foamy cups of cappuccino or peppermint tea, of long-ago dinners and late-night phone calls with martin luther king. for all of these things, i am so deeply, blessedly grateful. i know, oh i know, that these days are not without bumps, not without heartache. and these nights are not stripped of the tossing and turning that comes with old-fashioned worry. but because thanks can never go on too long, i don’t think it’s a chore to begin the compiling. so if you’ve stopped by the table, and if you’ve something to add to the list of deep, down thanksgiving (and, yes, gassy little cabbage-ettes are more than welcome), please feel free to scribble your thoughts…..
for more than a minute, i’d decided that this week was best dispatched in nothing but snapshot. decided that if i dared type a word, i’d just slip the noose round all of us, and pull us all down into the murky sea in which i paddle. it’s not been pretty around here this week. been the sort of week where all you wish for is a fine pair of wings, to fly away home. tuck back under the covers of your comfy old bed. despite its sag in the middle. for more than a week now, we’ve been holed up here in a germ pit. a cauldron of germs, i like to think. all bubbling, and brewing, and running amok. the tall guy fell first, down for the count with a cold and a cough, so bad he stayed home from school for a day. next up was the little guy; he’s been out of school for over a week now. the mountain of make-up work is enough to make me run for the hills. 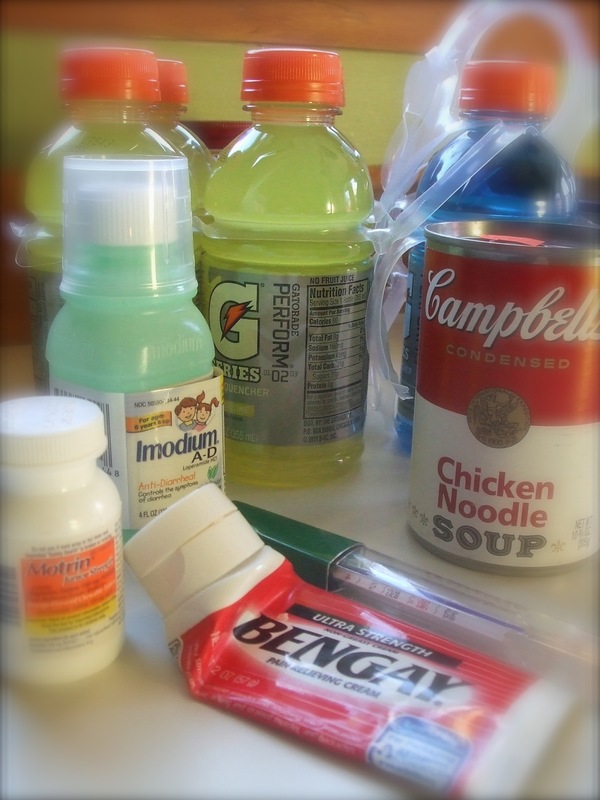 there’ve been nights when, at the very same time, the kid and the cat were both getting sick. and the cat, realizing the bathroom was occupied, decided to do his part right there on the living room rug. nice. so from 2:30 till 5 that night, i was the nurse and the char lady, running around with my mops and my rags and my buckets, cleaning this way and that. only made it to three of nine classes this week. missed election night altogether. didn’t even stay up for the speeches. but i did manage to meet the nicest pediatrician i’ve met in a very long while. would love nothing more than to sit down with her, over a long cup of tea. or, even better, follow her through her days, notebook in hand. or, sign up to be her partner in medicine, in the fine art of truly caring for kids, and the people who love them. she called here twice this week, late in the evening, just to check on the little guy — he was that sick. so sick. scared me, the little guy did. when nothing stayed down from saturday through late wednesday night, i thought they might need to poke him with IVs, pump him with fluids, get him back on his feet. poor kid missed basketball tryouts, the one thing he’d hoped would carry him through the long cambridge winter. and then, when in my blurry-eyed stupor i reached way down low and too far across to grab a medicine spoon from the bowels of the dishwasher, i felt something go krrrrrrrrink, there in my back, where krinks are not a good noise. ever since, i’ve been ambling around like some sort of odd-wired skeleton. one who tilts in the wind. even in no wind. speaking of wind, we got our first snow. snow, sleet, hail, the whole shebang. did i mention that i suddenly realize how far we live from most of my classes? that nice brisk 17-minute walk now feels like a trek cross siberia. and, suddenly, visions of home swirled in my head. that nice old station wagon, asleep in the car barn, tucked in for its long winter’s nap. i remembered how it used to drive me wherever i wanted to go. say, to the grocery store. a modern convenience, one i’d too long taken for granted, apparently. a place where, in one fell swoop, you can pick up a crate of kitty litter and a tub of ricotta. who knew there’d come a day when that simple equation took on the glimmer of luxury? and so it went. i’ll not drone on forever here. you get the point: some weeks, no matter the ZIP code, no matter the wrappings and trappings, it’s all best left a blur. in light of the true tragedies of the week, the displaced folks in new york and new jersey, hit first with sandy and then the nor’easter’, and in a week when our truly beloved lamcal lost her mama, i should not utter a single word. forgive me. just keeping my promise to type a dispatch a week. we all weather our share of lumps and bumps, some weeks it’s just harder than others, when they all swirl in an unstoppable torrent. my true prayer this week is for lamcal, whose heart is filled with the ache of the loss of a lifetime. sending love, always. i scanned across the list of saints whose lives we’d be studying — gandhi, martin luther king, thich nhat hahn, abraham joshua heschel — and i was hooked. i saw one more — dorothy day — and i was writing the professor begging to be allowed at the seminar table. dorothy — for i don’t think she’d want me to call her ms. day; she’s not like that — has been my deep catholic hero for a long, long time. her brand of catholicism, the catholic worker movement founded, in part, on hospitality houses for the poor, the lost, the wholly left-to-the-margins, is the brand i still believe in. i grew up, spent my holy years, in the 1960s. stepped into my first dark confession box back in those turbulent days — just post vatican II, when the church was turned on its head, a year after JFK was assassinated, at the height of the escalation of the vietnam war — heard the opaque window slide open, heard the priest’s breathing, heard my own heart pounding as i scoured my soul, got ready to spill all my sins there on the ledge. tasted my first dry, wheat-y communion wafer. wondered what to do when it got stuck on the roof of my mouth. and then, in seventh grade, it got really deep: we had a nun who’d stripped off her habit, who stood there in sweaters and skirts, strummed a guitar, and turned off the lights so we could watch — over and over — “the red balloon,” sing kumbaya. radical jesus — with his long curly hair and sandals, friend to the thieves and the whores — was a god made for the decade of protest, anti-establishment. all along, i’d spent hours at bedtime, praying that i could be better come daybreak. be more of a saint. try harder. one lent, when i was in third grade, i think, i got up early, rode my bike to 7 o’clock mass every morning. because i thought it would make my soul shine brighter. and then, along came the likes of mother theresa and gandhi, and later, dorothy day. they were my brand of catholic. they scooped souls out of gutters, touched the untouchables, turned away from the gilded altar cloths and the chalices locked away in a safe in the dark of the church. they were what drew me to appalachia in college, what pulled me into a soup kitchen on the west side of chicago. they and my mother, truth be told. but my mother has never written out her theology, just told me once, in a few short words (all i needed to hear really) that, after my father died, she figured she’d devote all the days of her life to God, and live a gospel of love. so she does, and i watch. 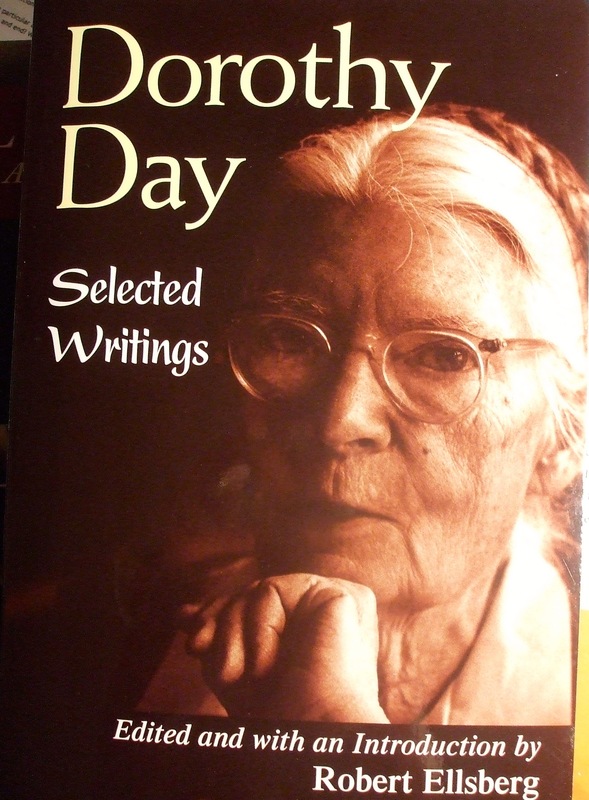 over the years, i’ve read snippets of the life of dorothy day. knew enough to call her my hero, claim her as my personal saint. but i hadn’t taken the time to pore over her writings, to absorb the whole of her story — in her words. and right now, because we’re at that part of the reading list, because for the next two weeks, on mondays at 4, i’ll be sitting at the seminar table in the great gray stone tower that is harvard divinity school, i am reading dorothy. curled up on the couch with her all yesterday afternoon, an afghan under my bare toes, a fat mug of tea and an orange fueling me along the way. — from “Dorothy Day: Selected Writings,” edited and with an introduction by Robert Ellsberg. by little and by little. now there’s a theology i can grasp, clench in my hot little fist. we could only make use of the little things we possessed — the little faith, the little strength, the little courage. these were the loaves and fishes. we could only offer what we had, and pray that God would make the increase. most days i don’t have much. but by little and by little, i can steady my wobbles, and put one foot forward. i can try, with all my might, to live a life of love, by little and by little. there is much this week to pray for, in the heartbreaking wake of hurricane sandy, who has left my beloved in-laws without heat or light or power on the jersey shore, who has turned my sister-in-law’s new york brownstone into a hospitality house for all those with nowhere to go. who spared us, and our sweethearts in maine. for all the heartbreak, up and down the eastern seaboard, i pray for repair and for strength, by little and by little. your thoughts on the wisdom of dorothy day? and if she’s not the one who guides your days, who is?